Chimney Brush 6" and 8"
Chimney Brush, Available in 6" and 8" sizes. 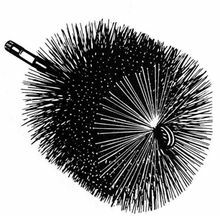 Stiff, oil tempered spring wire bristle cleaning brushes are designed for homeowners. Regular construction utilizes an open, single spiral design with 6" of fill, with plated shafts and 1/4" threading for easy coupling with fiberglass rods or pull rings.